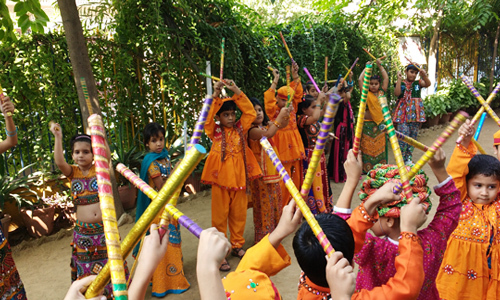 Our educational programmes nourish the child physically, emotionally, spiritually and mentally. 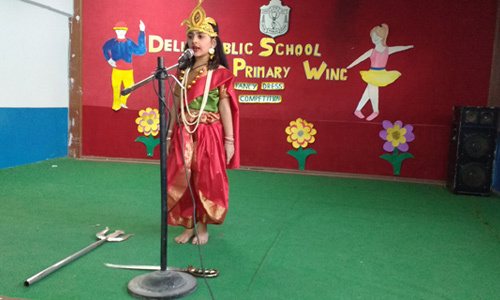 In addition to the academic lessons our school day is filled with sports, artistic endeavour, spiritual upliftment, & cultural activities etc. It is not the beauty of a building, you should look at but it’s the construction of foundation that will stand the test of time. 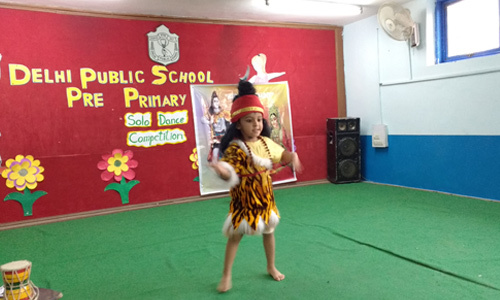 Centrally air-conditioned, safe and compact building with lush green areas. Food service areas- has been a crucial addition to our food program with fresh and healthy food option. Amphitheatre-complete with stage and surrounding. 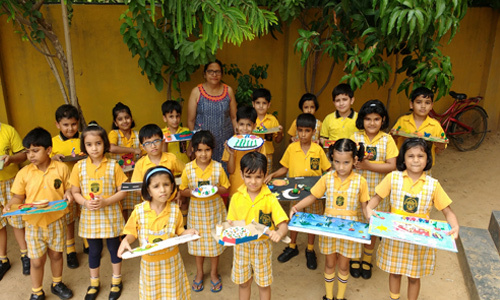 Our syllabus ensures that children have learning experience that challenges, stimulates, encourages creativity and love for learning. 100% PARTICIPATION IN ALL THE ACTIVITIES. 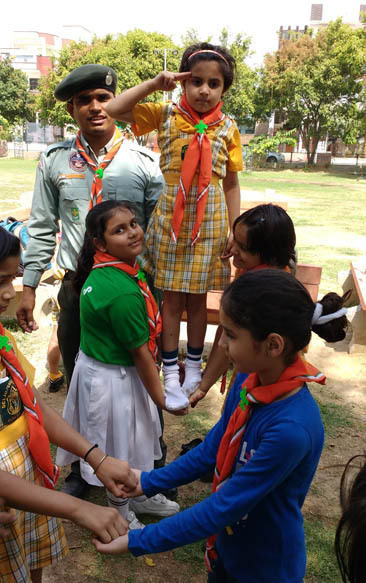 We have innovative, inspiring, interesting curriculum based activities in T@bkids session. 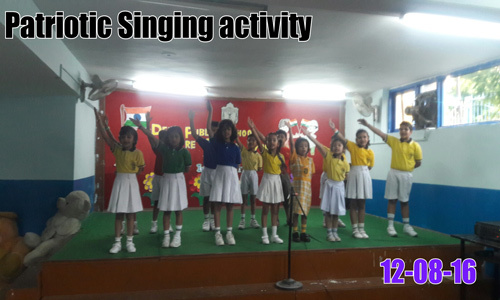 It maximizes learning by focusing on a childs visual attention and memory. 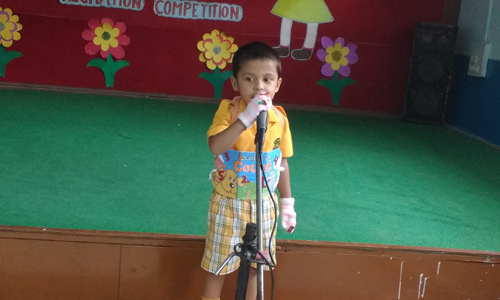 it effectively supports differential learning by handling diverse needs of all students. 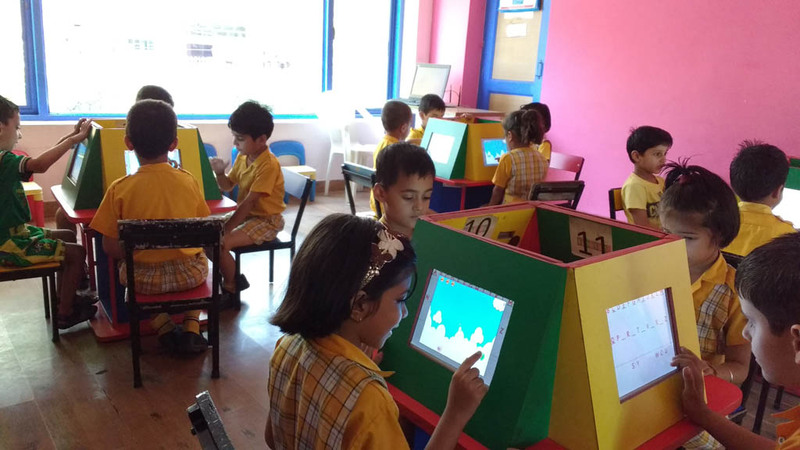 Teacher can manage and track every child’s progress and parents also have access to the entire repository of their child’s actitivities on T@bkids. Area with practice room-fully equipped with instruments and resources. 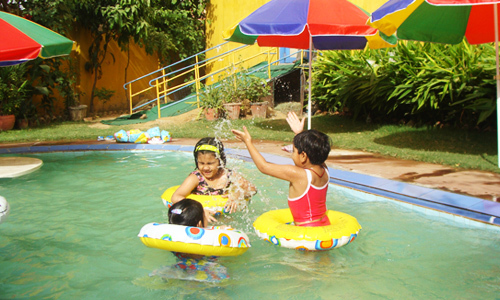 We have a splash area where the tiny tot enjoy & have fun like water polo, pool bash etc. 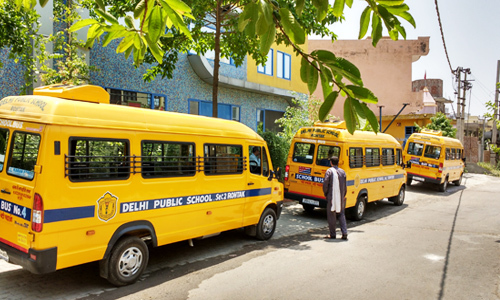 A fleet of fully air - conditioned transport facility to ensure the safety, security and comfort level of our little darlings. 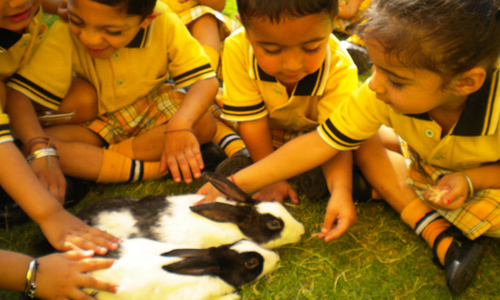 To inculcate love for animals pet rabbits are reared. Children are exposed to love and care of animals. 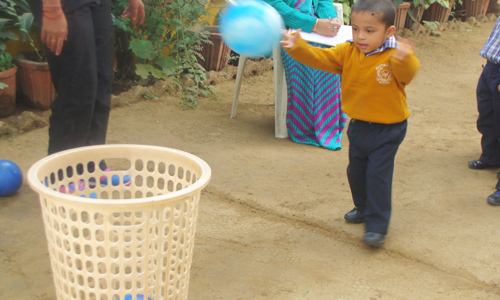 Play area to develop gross motor skills of the kids and to enjoy and bounce with the balls. 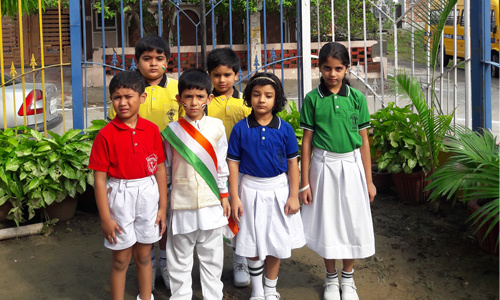 Children are exposed to a wide range of team games, both indoor as well as outdoor which includes football, cricket, badminton, kabaddi, kho-kho, carrom, chess, swimming, water polo, bowling, athletics etc. To make our students emotionally and physically strong various asanas and meditation is taught in the enriching yoga classes. 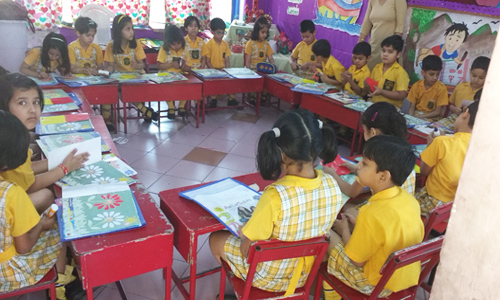 We are enriched with flexible, accessible, enthusiastic and caring faculty. 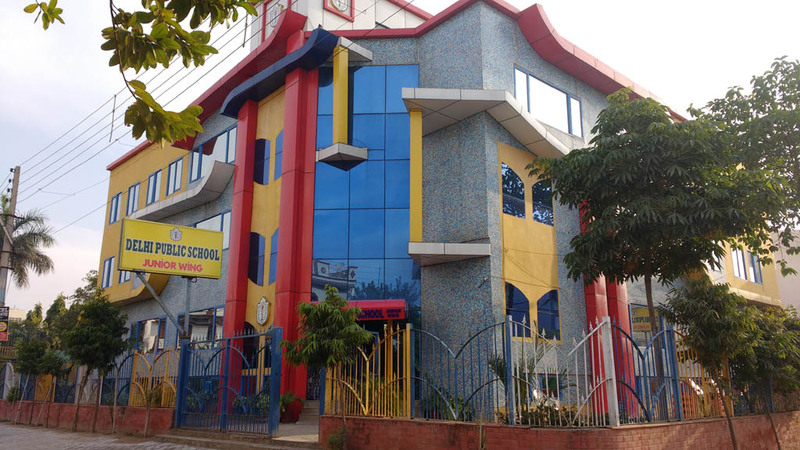 Experienced and trained faculty that works tirelessly to create a challenging nurturing environment for the students. In our classrooms each pupil’s ideas and opinions are valued.